"A Sicilian treat; ricotta cheese, flour, and sugar fried to an elegant golden brown and lightly dusted with confectioner's sugar." In a large bowl; mix eggs, white sugar, and ricotta cheese until smooth and creamy. Stir in the vanilla and flour. If the batter is dry mix in a little of the milk. In a frying pan over medium high heat, heat vegetable oil until hot. Drop teaspoonfuls of batter into the hot oil and fry until golden. Turn to cook cookies evenly. Remove with a slotted spoon and drain cookies on paper towels. Sprinkle with confectioner's sugar if desired. 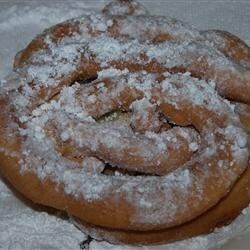 Can you scream FUNNEL CAKE! AWESOME! Put in a ziplock, snipped corner and made it like a funnel cake in peanut oil. AWESOME RECIPE! I followed the recipe exactly and they were pretty good. We definitely liked them better while they were hot. We did not care for the leftovers. This taste just like my Grandma used to make. It is so easy and just one bowl to clean, if your a true Sicilian or would like to be one, try these. Yummo! Kid friendly finger food. Excellent recipe, always a hit with the family. I like to add in 2 tablespoons of almond extract, too. Delicious! Like chewy little donuts, only better! Excellent recipe. Stayed fresh overnight.